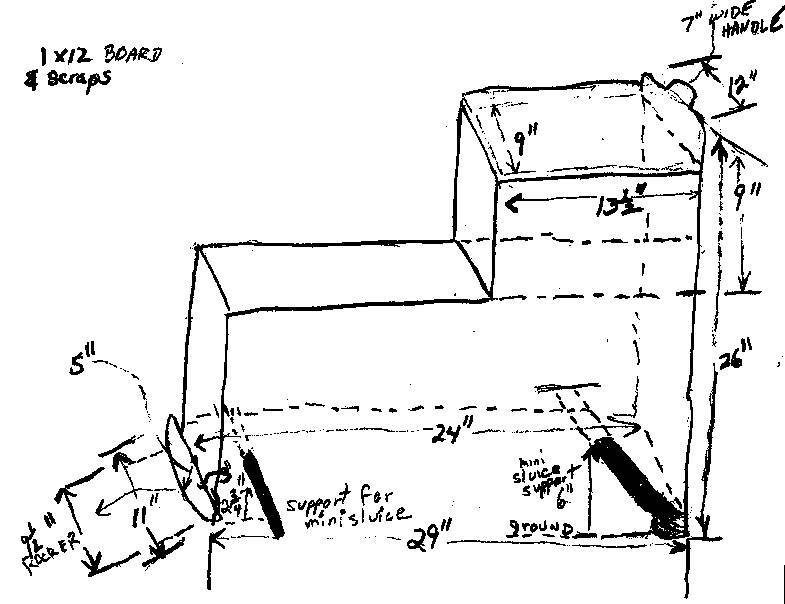 By way of an introduction, this is a rough drawing of a rocker box I built for myself. If you google ROCKER BOX GOLD you will find places that sell them, but the price is not for the faint of heart. 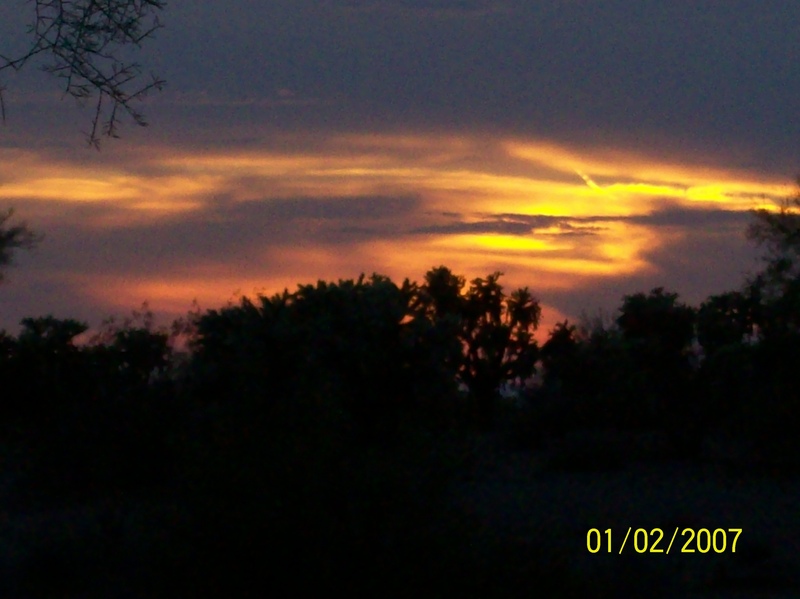 On a fixed income, as many of you are, I try to figure out how to do for myself. These rockers can be very useful for processing concentrate to pan. Black sand and other heavies (mercury, lead, etc) along with gold will be mixed in the concentrate gathered from the moss in the sluice that lies in the bottom of the rocker box. You take the moss out (disassemble the sluice) and rinse the left over material into a bucket. That is what you will pan. 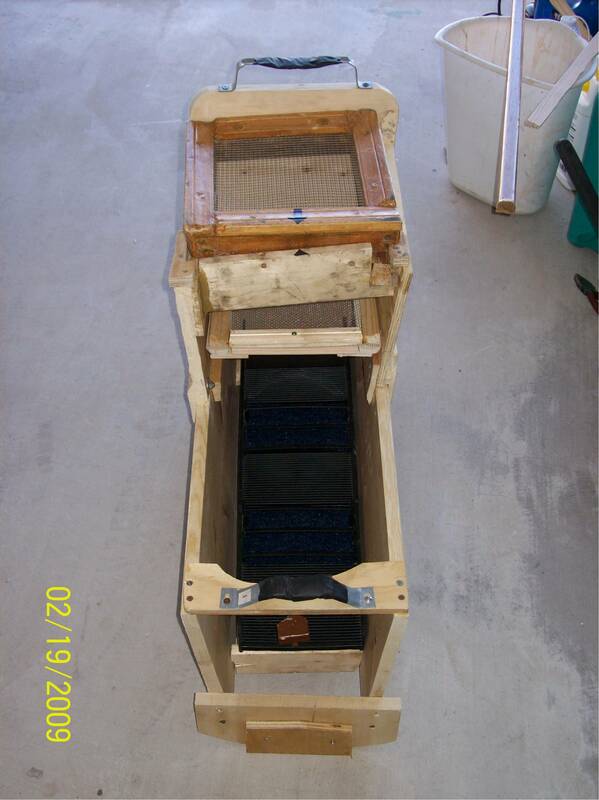 Put the sluice back together, reinstall into the box, and start to rock more material. I have a bit of a different idea about the box. 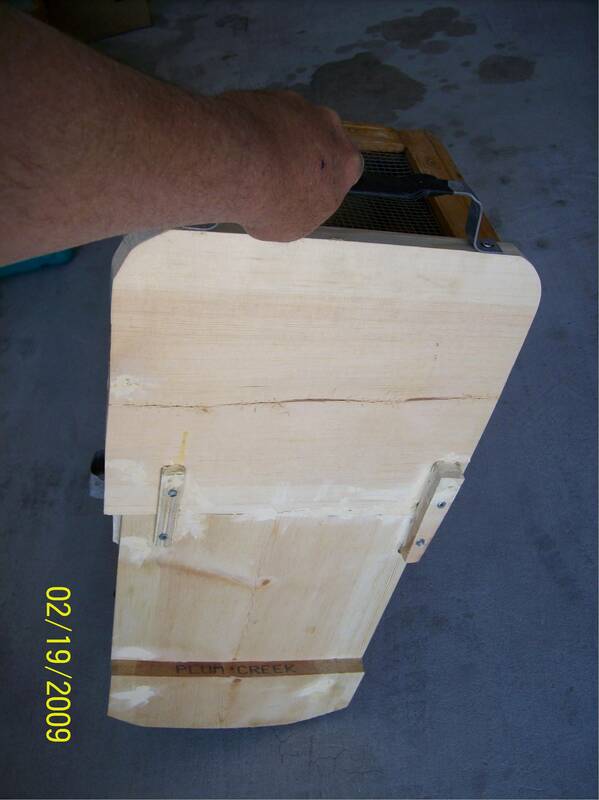 There are a number of people who have posted very good designs for rocker boxes on the Internet. You can even buy plans for them. I look at it differently. 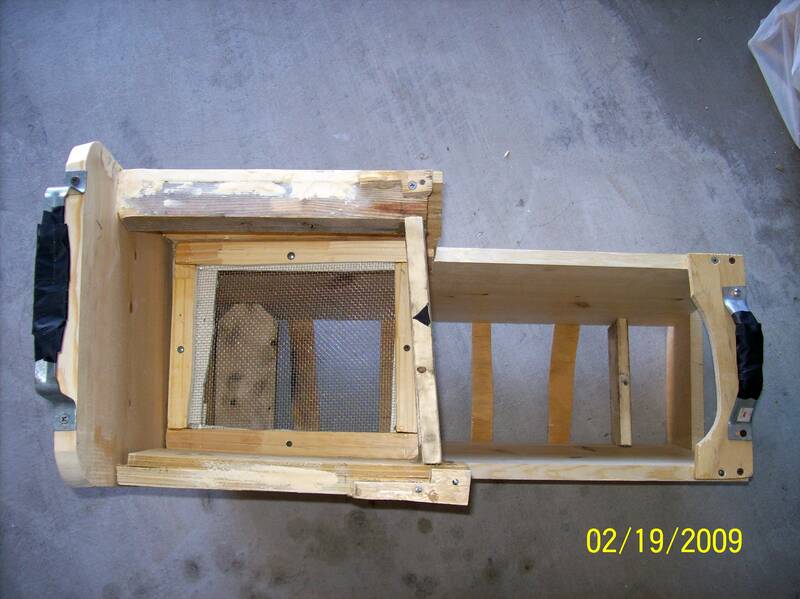 If you are not going to build screens or sluice because you have them (they need to be small), then design your box to take what you have. 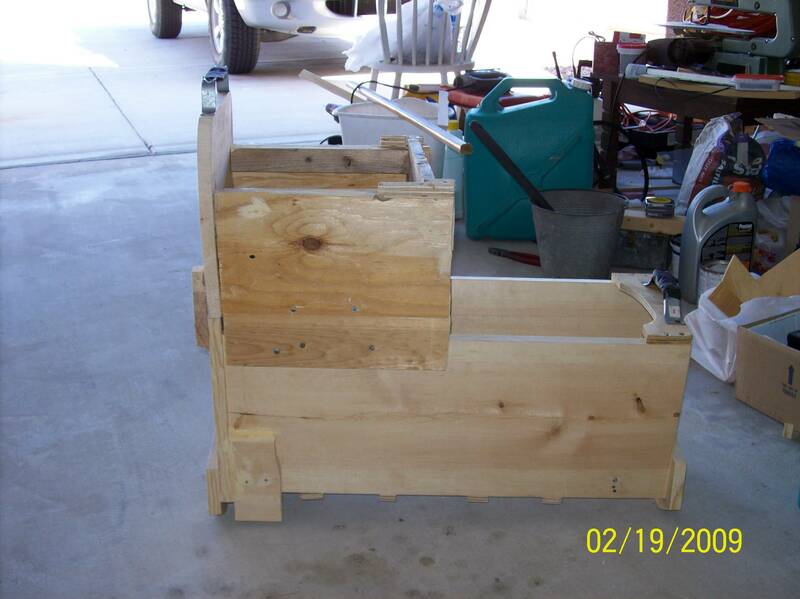 This box was designed to take an EZ -Sluice (trademark) made by TEEDEECO of Lakeport, California. That is how the dimensions were determined. I had previously made two screens to put on the top of 5 gallon buckets to classify material for panning. Instead of making new screens, I designed the box to also accommodate the screens I had. I guess you could say I am lazy, but making the box involved some time. So this is how I approached it. You could use my dimensions (you will have small adjustments as you go), or, more likely, a new plan. Many times the directions for making the rocker box that can be found on the Internet have so many dimensions and are so intricate that it would take longer than I was willing to put into it. This post is for those who are of like mind. Enjoy your prospecting. For actual photos of the rocker box, see the previous post. To get a better look at the classifying screens, look at the next post. If you have some experience prospecting for gold, you know that much of the equipment is pricey. I am not saying it is not worth it; prospecting for gold is a lot of fun. But if the price of items has held you back a bit from doing what you really want to do, here are photos of a rocker box that I made from scrap lumber. I even made the screens out of scrap. I hope to make a drawing with dimensions soon. In one picture you will see a black mini-sluice. These small plastic sluices cost you about $35 dollars. I bought one and built my rocker box to hold it. 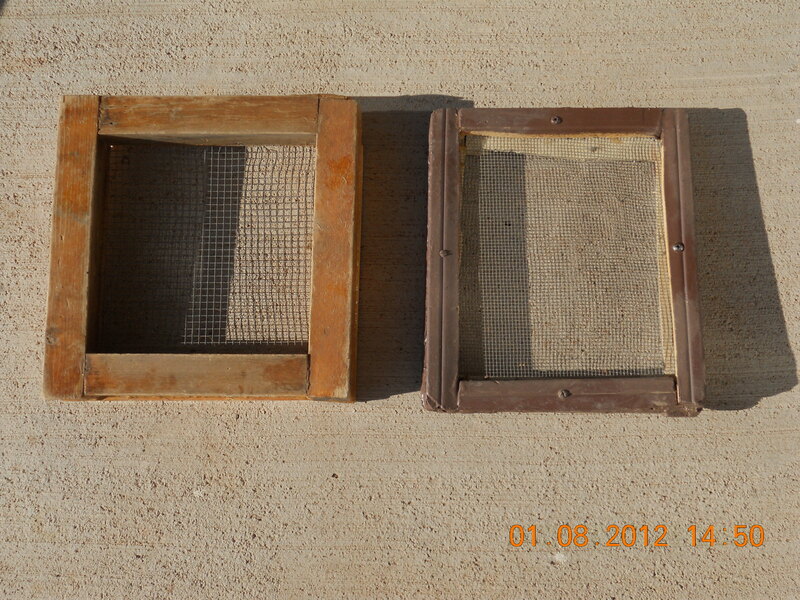 I put water through the screens (2, one of 1/4″, the second of 1/8″) to classify the material. I remove the screens and dump the rocks out. When you shake the dirt material down the sluice by rocking the box back and forth, and while pouring in water (which carried away dirt and debris) you are left with a concentrate of heavier small material. In theory, the gold, if it’s there should be hidden. Then one pans that material to find the gold. What this does is cut out a lot of panning, which also means you get rid of more material before panning. It helps your back and speeds the process up a bit. But you need to be near creek water for it to work. Otherwise you need to bring water, and you can run through an awful lot of water that way. I always use it when I know the water is running. Some of you may not have a problem with running water (you live near big streams that run year round). I live in Arizona, hence, I use it when the water is running at my favorite places.